Found 3 file extension associations related to Yu-Gi-Oh! Power of Chaos - Yugi the Destiny and 3 file formats developed specifically for use with Yu-Gi-Oh! Power of Chaos - Yugi the Destiny. Yu-Gi-Oh! Power of Chaos - Yugi the Destiny, Konami's latest title to bear the license of Kazuki Takahashi's popular anime, is little more than a bare-bones digital version of the collectible card game upon which the franchise is founded. For Yu-Gi-Oh! fans, the meager options make it less attractive than one of Konami's dozen or so other, more fully featured Yu-Gi-Oh! games, and to players who don't already have an investment in the series, it has about as much to offer as a game of solitaire. The Yu-Gi-Oh! Power of Chaos - Yugi the Destiny software seems to be old or discontinued. If you need more information please contact the developers of Yu-Gi-Oh! 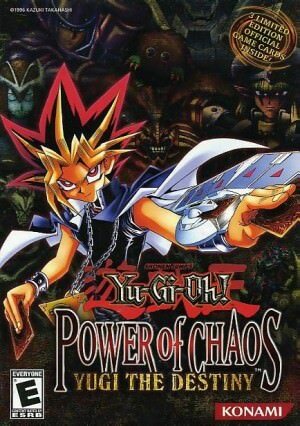 Power of Chaos - Yugi the Destiny (Konami Corporation), or check out their product website.